During 2012 Kool Kids Crafts Summer Workshop we held a kids origami session. The parents were more confused than the children but everyone enjoyed participating in this fun activity. This page will show you how we made the fish for the mobile on the right and some more easy animal paper folding and sculpting. A jumping paper frog, a dinosaur, an easy fish that can be hung with others as a mobile, and a fascinating paper sculpting activity called Gupit Gupit which is a form of origami. This is cute and ideal for kids origami. You can make 2 from a single sheet of origami paper and then jump race them across the table. Or cut out some large pond lily leaves to make an attractive table decoration. 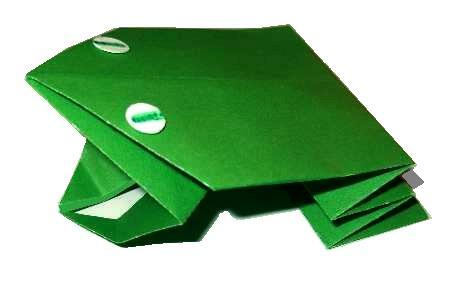 Here is a step by step illustrated guide on how to make the kids origami frog. Now kids who like frogs usually like dinosaurs too, and the Crew at Kool Kids Crafts are no exception. We bought a kit that has a back drop of scenery to display all the models that come in the kit. A few are simple and with some help younger children can master them. This dinosaur is in 2 parts which you tape together once they are both completed. The mind boggles why that other dinosaur is lurking in the corner of this picture. Maybe he is in on the kid`s treasure hunt coming shortly! This is one of the easiest projects in kids origami I have ever come across. 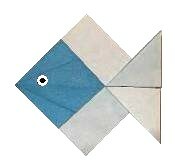 The fish can be made from different paper sizes and colors. 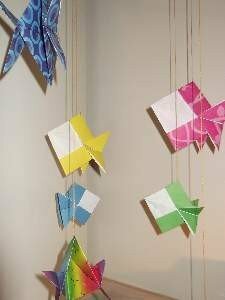 Hang them together as a mobile like the one we created at the summer workshop. The least movement of air gives the illusion of them swimming about in different directions. Get the instructions on how to make this origami fish and the following craft as a free printable activities download here. I came across this interesting paper craft, that went down well with my Crew. The name means "cut cut" which is what you do to the surface of the paper to sculpt it into shape. It didn`t fail to amaze the boys and they felt a great sense of achievement with their efforts displayed in the photo below. We found the instructions for each project in the book Papers, Scissors, Sculpt! by Ben A Gonzales very simple to follow, from beginners level to the more advanced. 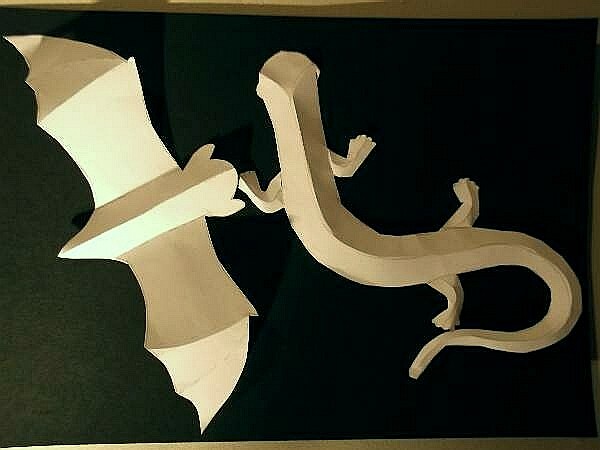 James, a 5 year old was able to master the sculpting and Iain, 8 at the time of making this salamander managed to score the fold lines, cut out his project, and sculpt it into shape. We have made up some of our own simple Gupit Gupit sea shells and creatures that you can download soon to and sculpt. (see the above link) Have some fun and experiment with colored paper for a beach or deep sea picture. 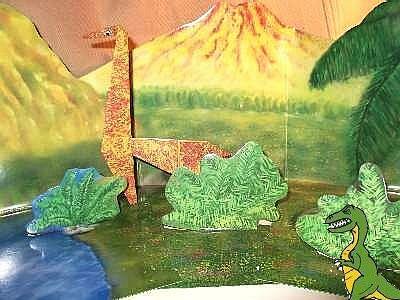 A teacher or parent should supervise this paper craft when using the scissors or a paper sculpting knife for scoring. I did this part for the Crew but Iain had a go at practicing scoring a few curves on his own for some future projects. ...or navigate to home page.